A meteorological drought is defined as a lack of precipitation over a region for a certain period of time. An agricultural drought is associated with a reduction in crops’ biomass and production due to a deficiency of water in the root zone. A hydrological drought is defined as a period of low flows in watercourses and lakes as well as low groundwater levels. Hydrological droughts take place after a prolonged time of low precipitation and deficient soil moisture and produce long-term (6-12 months and beyond) impacts. In addition to these definitions, which all consider drought as a natural hazard, we should also consider a fourth type of drought, namely the operational drought. 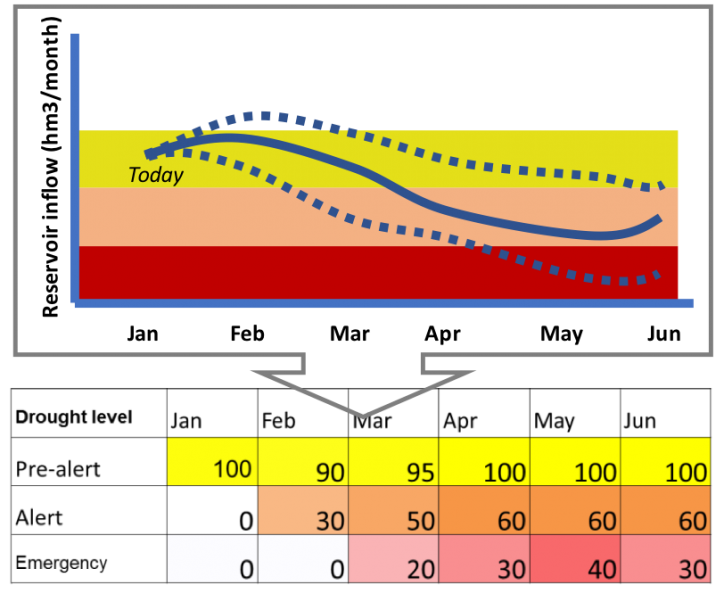 An operational drought is defined as a period with anomalous water supply failures. In this case, water resources stored in reservoirs and aquifers are depleted and water deliveries to water users (urban, agricultural, industrial, etc.) cannot be guaranteed. Drought impacts can propagate to virtually every water-related sector, such as farming, livestock production, industry, power generation, and public water supply. Over the past 30 years, droughts have affected about 11% of the European population, with total economic losses estimated to have reached 100 billion euros over this period. In addition, the annual average impact of droughts has significantly increased, reaching an average cost of 6.2 billion euros/year in the most recent years, with a peak of 8.7 billion euros recorded in 2003. Drought indexes are the main tools employed for drought monitoring, forecasting, and management. These indexes allow quantifying different drought parameters, such as the onset, intensity, duration, severity, spatial extent, and termination of drought periods. Although some indexes (e.g. Standardized Precipitation Index, Standardized Precipitation and Evapotranspiration Index, Standardized Runoff Index) are more popular than others, there is no index suitable for all situations. The hydro-meteorological conditions that develop during a drought are indeed highly variable across different climates and no single index is able to adequately capture all drought parameters across these diverse conditions. During the last summer, an extreme heatwave hit Europe generating also intense drought conditions that negatively impacts on agricultural activities across the continent, including IMPREX case studies. The lack of precipitation between October-2017 and January-2018 turned on all the red lights in the Jucar River Basin Authority. With reservoir levels at its minimum since 2015, everyone reminded the last major drought suffered by the river basin (2005-2008) and prepared to experience the same situation again. Then, winds of change brought rain to the region in such a way that allowed the basin to avoid the repetition of the situation found during the last drought. The cumulative rainfall plot since October-2017 (Figure 1) shows a spectacular increase between January and June 2018 (blue), which turned the worst year since 1990 (lower green line) into an average one (red line). However, drought threaten has not left the Jucar River Basin yet, since reservoir levels are still low (Figure 2). The increase in precipitation during the beginning of 2018 was just high enough to return back reservoir storages to the levels found in 2016, but they are still 200 Mm3 below the 10-year average. According to this, Jucar River Basin managers and users will need to look again at precipitation forecasts and hope they bring more rainfall than in the last 3 years. Read more about the Jucar River drought monitoring system. The Segura River Basin has officially declared drought status to remain in effect until at least the 30th of September 2019. This comes in succession to a now 4-year period of drought first declared in May 2015. Despite above average rainfall in June, August and September and a momentarily cancelation of the state of emergency to pre-emergency during spring, reservoir levels are at 22 per cent of capacity beginning of October 2018. This implies the continued adoption of extreme measures such as high-water transfer from the Tajo to the Segura in addition to drought wells and aquifers extraction for the time being. Read more about the Segura River drought monitoring system. Despite 2018 winter was characterized by strong snow precipitation over the Alpine region, the summer period didn’t benefit too much from such snow (and snowmelt) abundance and the basin moved rapidly into drought conditions. Figure 3: Comparison of Lake Como levels against historical maximum, minimum, and average. This unexpected evolution is well illustrated by the trajectory of Lake Como levels illustrated in Figure 3: at the beginning of April, the lake level in 2018 (blue line) was close to the average conditions (green line) and in the following weeks it increased above the average with the large contributions from the snowmelt. Yet, the figure shows a fast drawdown cycle starting in June till the end of August, when the lake level approached the historical minimum (yellow line), with sandy shores emerging in the center of the lake (see Figure 4). During the summer, the lake was operated to satisfy the downstream irrigation water demand and suffered from low inflow volumes that did not balance the release. Read more about the Lake Como drought monitoring system. Figure 4: Sandy shores emerging from the lake (left) with respect to the lake in normal conditions (right). 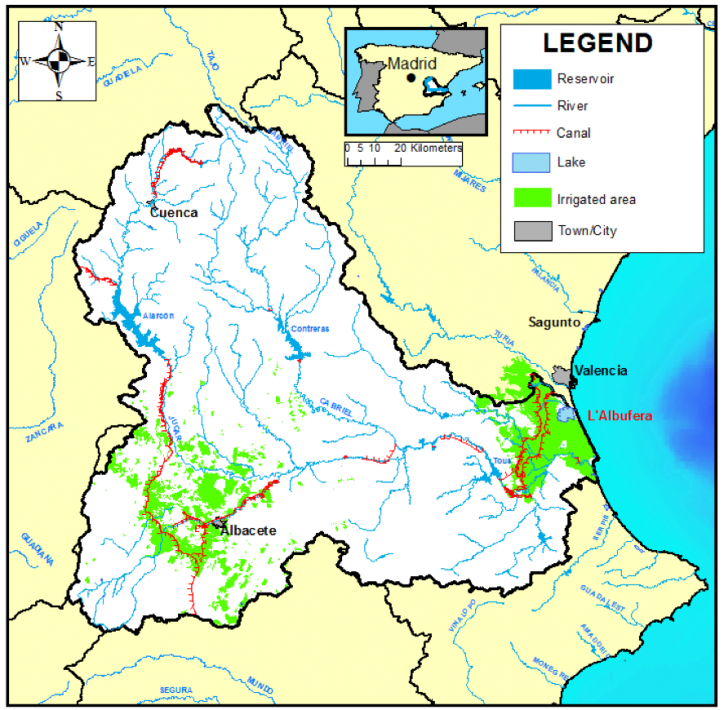 The Jucar River (Figure 5) is characterized by an irregular hydrology, as the rest of the Mediterranean Spain: flood hazards in the autumn and distinct low flows during the summer, when agricultural demands concentrate. Droughts have been common in this region since the Middle Ages, as shown by the large number of records of prayers for water and evidence of water conflicts. This includes Royal Court sentences solving water-sharing conflicts in which an explicit mention of droughts was made. Some of these sentences even established how the water-sharing mechanism would be modified in case of a drought event, containing precise drought definitions. In some cases, two stages of drought were identified, which would be called “mild drought” and “severe drought”. The core idea behind these mechanisms was to trigger different actions in response to a drought period, depending on how severe the drought was. Figure 5: Jucar River Basin map including rivers, main infrastructures, and urban and irrigation demands. Today, the Jucar River has changed a lot compared to the Middle Ages. These modifications include the construction of more than 10 reservoirs (the most important of which are the Alarcon, Contreras and Tous, with a joint planned capacity of more than 2,000 Mm3), 3 canals in which the surface Jucar River is conveyed to distant areas such as the city of Valencia, and many wells that extract water from different groundwater bodies. Equilibrium in the Jucar River system is fragile, since demands equal the total average discharge of the river (around 1,550 Mm3/year). The combination of intensive water use and recurrent droughts due to its Mediterranean climate turns drought forecasting and management in the Jucar River Basin into a challenge. Drought management in the Jucar River Basin, and in all of Spain, refers to drought early warning, monitoring and mitigation (i.e. measures that seek to reduce the negative impacts of droughts). These three aspects are specified and developed in a Drought Management Plan (DMP), elaborated by the Jucar River Basin Authority, following the guidelines set by the Spanish Government, which demands that each river basin has a DMP (the first round of DMPs was launched in 2007). This nation-wide protocol ensures that all river basins in Spain have a uniform drought management strategy which can be coordinated at the national scale. Drought early warning in the Jucar River Basin does not rely on inflow forecasts, but on the combined use of drought indexes and threshold levels. In the DMP of 2007, a unique State Index (SI) was set by combining the values of different variables that were affected by droughts (e.g. rainfall records, streamflows, inflows to reservoirs, storage levels, groundwater tables, etc…). These variables are monitored by the SAIH automatic information system (http://saih.chj.es/chj/saih/?f ; Figure 6 left), which also serves as a flood early warning system and a monitoring system of the impacts of drought mitigation measures. The SI is updated each month and compared to the threshold levels established by the Jucar River Basin Authority (Figure 6 right). These levels are: normality (green), pre-alert (yellow), alert (orange), and emergency (red). In the ongoing revision of the DMP in 2018, two indexes have been established: a Drought State Index (DSI), which measures the existence of a hydrological drought; and a Scarcity State Index (SSI), which determines the existence of a socio-economic drought caused by a hydrological drought. The latter resembles the previous SI, while the DSI uses the Standardized Precipitation Index. Figure 6: Screenshot of the Jucar SAIH webpage (left) and State Index (SI) evolution for the Jucar River (right) obtained from the 2017 Drought Management Plan (DMP). Depending on the SI (now the SSI) value and its comparison with the thresholds established, different measures to prepare and cope with the expected impacts of droughts are triggered. In a pre-alert state, for example, system preparedness against a likely future drought is checked (e.g. absence of emergency well malfunctioning, intensification of water and environmental monitoring, user awareness, etc…). Similarly, in the alert state, measures like the increase of groundwater abstractions and the use of regenerated water, among others, are triggered. This linkage between SI values and measures established by the DMP, which is the result of a negotiation and agreement process among stakeholders, enables a quick and transparent preparedness and response against a drought event, reducing as much as possible the necessity of negotiations when the drought is present. Furthermore, it ranks droughts depending on the severity, and determines the intensity of the measures to be applied (e.g. groundwater extraction rates in the emergency state are higher than in the alert state because the drought is more severe and, consequently, temporary aquifer overdraft is accepted). Another advantage is that under- or overreaction are avoided, since an improvement in the system state (e.g. from alert to pre-alert) immediately modifies or stops the measures to be applied. Although the performance of the DMP set in 2007 against the 2005-2008 drought was found to be adequate, its periodic update was scheduled (it will be updated for each 6-year period after its first update in 2018). This enables the acquisition of new information sources and variables monitored, reconciles drought management with long-term planning, facilitates the adoption of new technologies and methods to detect and respond to droughts, makes it possible to consider the evolution of climate change, and allows an adequate uptake of the lessons learned during the last years. Although the Jucar River Basin drought early warning system does not use forecasts at the moment, it is likely that skillful meteorological and hydrological forecasts, such as the ones currently under development within IMPREX, will be implemented in the future. However, the rationale behind any DMP for the Jucar River Basin is exactly the same as in Middle Ages: determine if a drought is about to come (or has already happened) and trigger the best measures depending on its severity. The Segura River Basin (SRB) is located in the south-eastern corner of the Iberian Peninsula, and covers 20,234 km2 (Figure 7). This semi-arid Mediterranean region is characterized by a mean annual temperature of 18 °C and mean annual precipitation ranging between 300 mm/year in the downstream areas and 600 mm/year upstream. Most of the rain falls in a few intensive rainfall events that take place in spring and autumn. The temperature conditions make the area suitable for profitable agriculture (e.g. fruit trees, horticultural, etc…) in spite of having the lowest percentage of renewable water resources in Spain and recurrent drought episodes. The River Basin Authority of the Segura Basin (Confederación Hidrográfica del Segura – CHS) is in charge of managing most of the water-related infrastructure and distribution of the water resources in the basin. During drought periods, CHS has to take decisions on the use of alternative water resources, such as groundwater and desalinization, and their allocation across the basin taking into account water rights, water demands and environmental commitments. 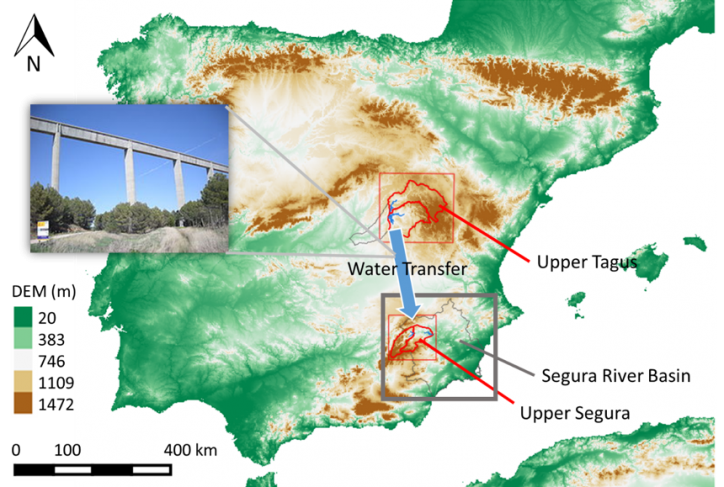 Part of the water demand of the Segura Basin is met with water from the Tagus Basin in Central Spain through an infrastructure of about 300 km long. The Tajo-Segura Water Transfer (TSWT) (Figure 7) provides more than one-third of the total water demand for irrigation from the upper Tagus River Basin – in total about 80,000 ha. SCRATS (Sindicato Central de Regantes del Acueducto Tajo-Segura) is a consortium of 80 irrigation associations that rely fully or partly on the volume transferred to the Segura Basin. This consortium represents their interests (in total 80,000 irrigators) and negotiates with the public authorities on their rights and allocations. This water transfer is said to contribute more than 2 billion euros per year to the Spanish GDP. Figure 7: Segura River Basin (gray square) location. Schematic of the water transfer infrastructure (pipes, pump-turbines, lifting station, tunnels, aqueducts). Red squares delimit the upper Tagus and upper Segura River Basins. Drought events are recurrent in the SRB. Over the last 35 years there were 4 drought periods (1980 – 1983; 1990 – 1995; and 2006 – 2008, 2015-current). The impacts are considerable: for example, the severe drought in 1994 led to an 11-19% reduction of production and a 14% reduction of irrigated area compared to average (CHS, 2007). Production losses due to the lack of irrigation water, in the last year of the extended drought period, amounted to 120 million euros. This reflects the direct economic effects of long lasting drought periods in the region, but of the same significance are the effects on other socio-economic factors, in particular direct employment, as well as induced employment in other sectors. The water received from the external water transfer depends on a hydrological drought index calculated from reservoir storage in the upper Tagus Basin. For decision making on the amount of water to transfer, this index is regularly forecasted using a simple statistical analogue method. As part of the IMPREX project, a climate-model-based seasonal hydrologic forecast is being developed for the Segura River Basin. This forecasting system combines a hydrological model (SPHY – Spatial Processes in Hydrology, www.sphy.nl) with the seasonal forecasted meteorological forcings (precipitation and temperature) from ECMWF and the UK Met Office, to produce reservoir inflows which are later translated into probabilities for the different drought levels over the following months (Figure 8). The irrigators that fully rely on this transfer could benefit considerably from enhanced forecasts of this drought index. Figure 8: Prototype of the forecasting system interface. Located in the Italian Southern Alps, the Lombardy region (Figure 9) is a heavily man-overworked land with a population of about 10 million people. It includes large storage capacity distributed in small reservoirs, mainly operated for hydropower production and located in the upper Alpine part of the region; regulated lakes in the middle region; multiple, often conflicting water consumption users in the lower region, where irrigation-fed agricultural districts cover more than 60% of the area. 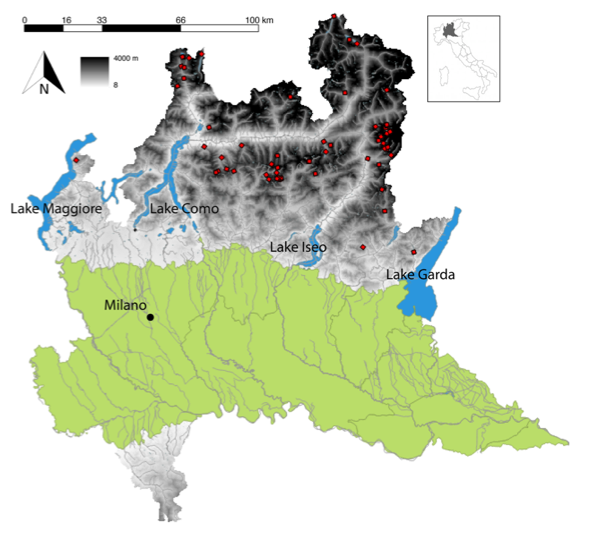 Figure 9: Map of the Lombardy Region, including the main lakes, the Alpine hydropower reservoirs (red points), and the downstream irrigation districts (green area). The hydro-meteorological regime is typical of alpine regions, characterized by dry periods in winter and summer, and peaks in late spring and autumn fed by snowmelt and rainfall, respectively. Historically, water availability has not been a major limiting factor in the region and water abundance rather than scarcity was often the primary concern. As a consequence, water institutions have not developed an advanced drought management system yet, but only provide a periodic (i.e. weekly) bulletin about the status of hydrologic resources in the region, including information about inflows, levels, and releases from the lakes (see Figure 10), temperature and precipitation, snow cover and snow water equivalent (see Figure 11). Monitoring the snow dynamics is particularly important as the spring snowmelt represents the main contribution to the creation of seasonal storage for both the lakes and the Alpine hydropower reservoirs. Figure 10 : Weekly trends in lake inflows (Afflussi), levels (Laghi), and releases (Deflussi - Livello Fiumi). Figure 11: Snow cover map (left) and Snow Water Equivalent in the Lake Como basin (right). The lack of an institutional drought management plan created some tensions between hydropower companies and farmers during recent drought episodes. Such conflict has been exacerbated by the advent of renewables, particularly after the Italian government largely subsidized solar power production, which reduced the electricity prices over the summer. This interannual patterns induces hydropower companies to decrease the summer production as it is less profitable than in winter. Yet, this strategy implies reducing the reservoir releases over the summer when agricultural irrigation demand is at its maximum. To mitigate the hydropower-farmers conflict, during the extremely dry summers of 2003, 2005 and 2006, the Regional Authority imposed a forced release by the upstream hydropower companies to alleviate the drought conditions that were seriously threatening agricultural yields downstream. This emergency measure brought little benefit to the crops, but resulted in significant economic losses for the hydropower companies, which started a lawsuit that was later settled with the Regional Authority having to pay hydropower producers compensation, given the release order was not compliant with the companies’ abstraction licenses. Since climate change is projected to increase the frequency and intensity of extreme events, the need of developing an effective drought monitoring and management system – potentially similar to the ones adopted in more drought-exposed EU countries such as Spain – will become a priority over the next decades.